The present investigation brings to light some of the changes associated with the use of English and Spanish in the US Catholic Church. The first part is an examination of the process of officialization from a historical perspective, acknowledging the impact of some groups or associations in the use of vernacular la!_lguages within the Church. The second part examines the role of acculturation during this process of officialization; and the final section analyzes the use of inclusive language in the Church, as an attempt to have a more gender-balanced institution. These three elements serve to provide a more complete perspective of the reality, expansion, revitalization and maintenance of the Spanish language in the United States. The article also reveals some of the language planning policies (direct and indirect) that have made an impact on the use of Spanish within US Catholicism. John Benjamins Publishing Company should be contacted for permission to re-use or reprint the material in any form. Medina-Rivera, Antonio. 2012. 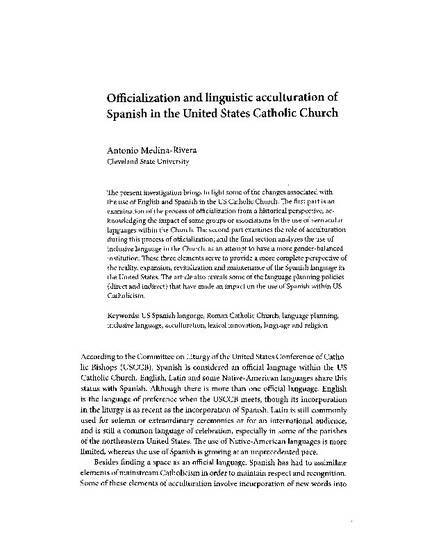 "Officialization and linguistic acculturation of Spanish in the United States Catholic Church." Language Problems & Language Planning 36, no. 2: 149-165.